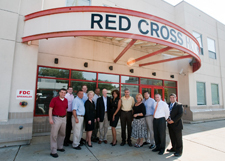 Rep. Frank Farry (left) joins other members of the Subcommittee on Security and Emergency Response Readiness on a tour of the Red Cross House in Philadelphia. Rep. Frank Farry (R-Bucks), who chairs the House Veterans Affairs and Emergency Preparedness Committee’s Subcommittee on Security and Emergency Response Readiness, led other members of the subcommittee on a tour of two facilities in southeastern Pennsylvania to learn about the roles and responsibilities of the facilities in the event of an emergency and to see how prepared they are should an event occur. In light of the Fukushima nuclear accident in Japan, the subcommittee visited Excelon Nuclear’s Limerick Generating Station in Montgomery County – one of three Pennsylvania nuclear power plants operated by the company. Farry’s subcommittee also visited The Red Cross House, located in downtown Philadelphia, which provides emergency housing for victims of disaster. The modern, 33,000 square-foot building can accommodate up to 120 people at a time. “The Red Cross House provides shelter, medical attention and caseworkers who offer counseling and financial services for individuals and families displaced by fire, flood or other disaster,” said Farry. “Depending on the nature of the emergency, victims can stay up to 21 days or until they can safely return to their homes. If they cannot return home, the Red Cross and other social service agencies assist them in finding housing and provisions. “When disaster strikes, it is especially devastating to victims who have no place to go. The Red Cross House provides a lifeline and a way back for people who have lost everything, and it allows families to stay together. “The Lower Bucks Chapter of the American Red Cross will soon merge with the Southeastern Chapter in Philadelphia. I met with the chief executive officer of the Philadelphia chapter to discuss the impact of service delivery to residents of Lower Bucks County due to the merger. “These tours provide my committee with valuable insight into the measures that would be taken in an emergency and help to expose any weaknesses or deficiencies that may exist in the state’s overall disaster plan,” he said. Tours are also planned for the State Fire Academy in Lewistown, the Penn State Applied Research Laboratory, a Marcellus Shale fracking facility in Towanda and the Pennsylvania State Police Fusion Center.